Barbara Lawlor, President of Baker Real Estate Incorporated, is pleased to announce the promotion of Debbie Lafave to Vice President. Debbie came to the Baker team one year ago with a wealth of experience in project sales and marketing including 17 years at Intrawest, responsible for sales at both the Tremblant-Quebec and Blue Mountain-Ontario resorts, where she and her teams sold over a billion dollars worth of real estate. Prior to joining Baker Real Estate, Debbie was Vice President of Sales & Marketing for Sotheby’s International Realty Canada. She was responsible for the execution of all sales and marketing strategies for prestigious development projects in North America and the Caribbean. A native Montrealer, Debbie is fluently bilingual. She also currently holds her real estate license in the Province of Ontario and is well versed in condominium law and resort development. As a key member of the team, Debbie will continue to advance the firm’s position in the industry. With annual sales of nearly two billion dollars and offices around the globe, including Toronto, Montreal, Florida and Singapore, Baker Real Estate Incorporated is one of North America’s most successful real estate companies. Baker specializes in the marketing and sales of new home communities, including high-rise, hotel condominiums and resort properties. Founded by Pat Baker, the company continues to uphold the tradition she established of providing exemplary service to North America’s premier builders and developers. JOIE DE VIVRE IN MONTREAL! ≈ Comments Off on JOIE DE VIVRE IN MONTREAL! Ever since Baker Real Estate Incorporated launched its Montreal operation last fall, business has been booming! “Immobilier Baker” is currently representing two exciting developments, with several more coming on board this summer and fall. Our decision to have a presence in that gorgeous city is proving to be a wise one. We had a hunch that the demand for new condominiums there was certainly accurate. The real estate situation there reminds me of Toronto nearly a decade ago. People in Montreal are realizing the benefits of eliminating long commutes from their lives, and the idea of living in the urban hub is appealing to a growing segment of the population. Our newest Vice President at Baker Real Estate Incorporated, Debbie Lafave, is from Montreal, and she has been a major champion of Baker establishing a presence there. She and I traveled to that beautiful city many times to explore the marketplace, and we were astounded by the growth. And why not? Montreal is absolutely captivating with its European feeling and incredible shopping, fashion and culture. Toronto is the Mecca of real estate development, but as land becomes scarce here, many Toronto developers are now calling us into meetings regarding land acquisitions and projects they are evaluating in Montreal. Our phones are ringing off the hook with inquiries. Since we made our presence there known last summer, they have visited the city, and they can literally feel opportunity in the air. Construction cranes dot the horizon and new development activity is buzzing, a situation that hasn’t occurred there in years. Our developers bring a lot to that city including a wealth of experience in creating condominiums, from the approvals process to sales and marketing. Montreal has welcomed Baker with open arms as well, especially because we have a finger on the pulse of the market and buyer preferences through Debbie. We continue to hear that Montreal is different, and it is. We are able to stand up with pride that we are prepared to accommodate this unique perspective. As someone who grew up in Montreal, Debbie understands the buying culture, and I have the experience and know-how to harness that for success. During our trips to Montreal, we met developer Mitch Abrahams of Malen Capital Corp. and The Benvenuto Group, who had already figured out the city’s appeal. He is also from Montreal and has family there. He and his firm are developing Onyx Condominiums, and he asked us to represent the residence. It was a natural fit, and Onyx was our first launch there in the fall. The condominium was incredibly successful, with people lining up around the block to buy. In fact, it was so successful that it is already under construction. At the opening, there were long line-ups of people who were excited about owning a condominium suite in Côte-des-Neiges, across the street from beautiful Mount Royal. This area is only five minutes from downtown Montreal. And as we have worked with Mitchell Abrahams on 83 Redpath in Toronto, we knew that Montrealers would be impressed with the design and quality this developer offers. If you are moving to Montreal or would benefit from having a pied-à-terre in that city, act now – only a handful of suites remain. Watch for more information on our Montreal offerings in the near future. Check the Baker Real Estate website for updates. www.baker-re.com. Those of you who are thinking of diversifying your real estate portfolio, or who travel to western Canada often on business and need a pied-à-terre, may want to look to Calgary, where an urban metamorphosis is going on. 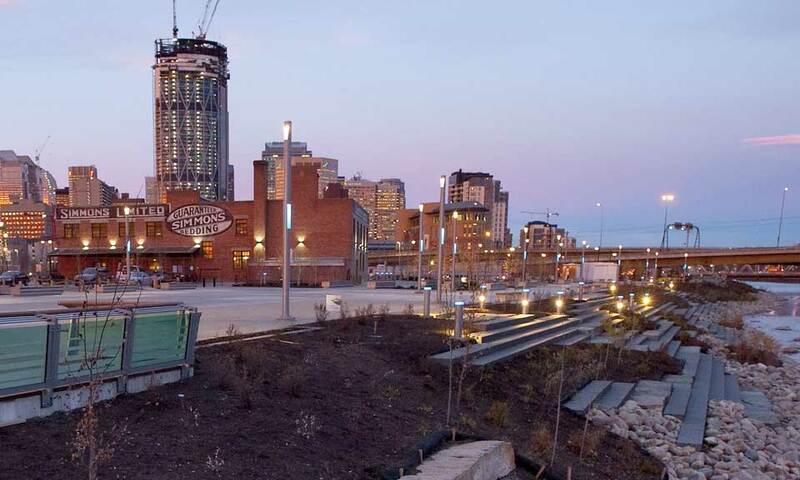 The Calgary Municipal Land Corporation (CMLC) has a remarkable redevelopment underway on the 49-acre property between historic Fort Calgary and the downtown core. Part of the Rivers District Revitalization Plan, this community is situated at the confluence of the scenic Elbow and Bow Rivers. The design for the area will transform it into a vibrant, mixed-use, creative neighbourhood with outstanding recreational, dining and residential opportunities. The East Village is changing the way people look at Calgary by providing a beautiful and convenient link for urban explorers. Baker Real Estate now has the exclusive Toronto listing for FIRST by Fram Building Group and Slokker Group. 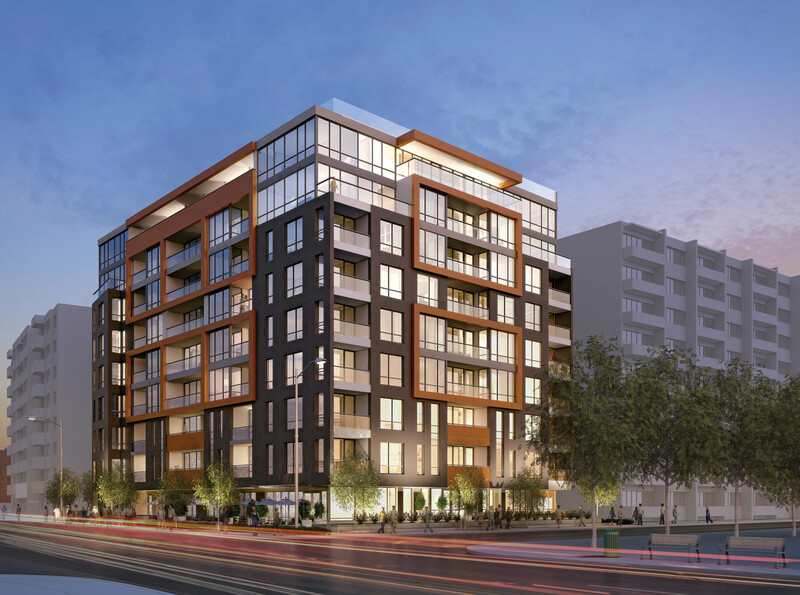 This will be the first residential condominium constructed in Calgary’s new urban village. Livability is the key driving factor in the redevelopment, and FIRST certainly offers that – for incredible prices. Suites start from the mid-$200,000s, or approximately $500 per square foot. You can find that kind of pricing in the GTA, but not in downtown Toronto. At FIRST condominium, your suite will be just a stroll to Calgary’s urban centre and the scenic natural areas along the rivers. Part of CMLC’s rejuvenation includes a new bridge being built to St. Patrick’s Island, which along with St. George’s Island are a stone’s throw from East Village. St. Patrick’s Island features a picturesque park that is also being improved to serve all residents of Calgary. 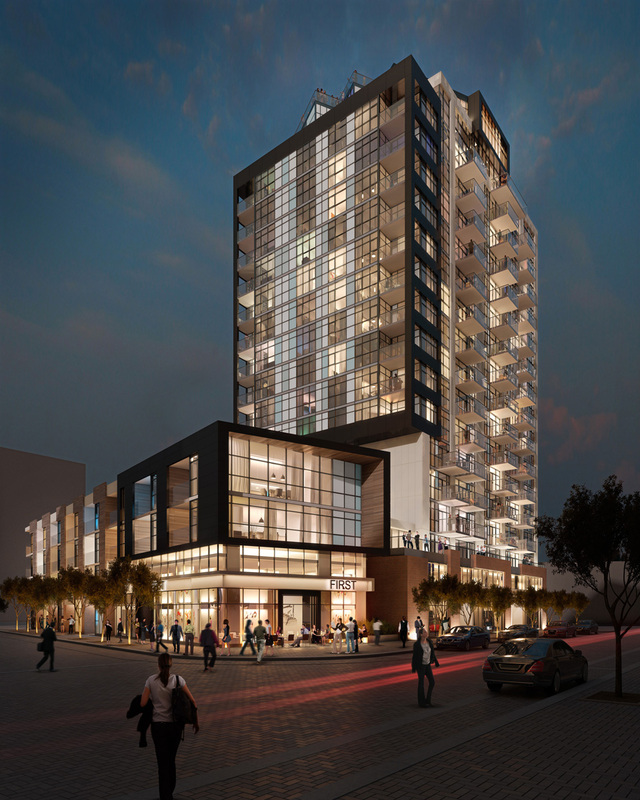 Suite owners at FIRST will be able to walk out of the condominium and access RiverWalk, which meanders four km along the south side of the Bow River, and eventually along the west bank of the Elbow River to Lindsay Park. RiverWalk will be an important part of everyday life, offering benches, picnic areas, outlooks, a wide public plaza, terraced steps to the riverbanks, designated spaces for pedestrians and cyclists, native plantings and more. That covers “live” and “play” – and many FIRST residents will be able to add “work” to their lifestyle benefits. The nearby Bow Building, Canada’s tallest office tower outside Toronto, is nearly complete, and companies are moving into the lower floors. Those who work at the headquarters of EnCana Corporation and Cenovus Energy can commute on foot or by bicycle. And for those whose jobs take them farther from home, Calgary is home to C Transit, a light rail that runs right through the heart of East Village. Entertainment-lovers and sports fans will appreciate living close to Scotiabank Saddledome, as well as the new National Music Centre, which is slated for completion in 2014. The excitement in Calgary is phenomenal as the entire east section of the city becomes invigorated. Now is the perfect time to be among the first to explore FIRST and all that the East Village has to offer. To find out more, visit www.baker-re.com. Recently, the Building and Industry Land Development Association (BILD) held its 32nd annual awards ceremony to celebrate outstanding excellence. A highlight of this exciting evening was the presentation of the Lifetime Achievement Award to one of the building industry’s veterans, Rudolph (Rudy) P. Bratty. Chairman and CEO of The Remington Group Inc. and founder of Bratty and Partners LLP, Mr. Bratty’s industry experience spans the gamut from residential and commercial real estate ventures to finance and publishing. His visionary and legendary approach to real estate development is the driving force behind Downtown Markham, which was also singled out with a pinnacle award from BILD. Among Mr. Bratty’s many admirable qualities is philanthropy – the caring man is selfless when it comes to donating time and resources to helping the greater community. He is director on several boards and is dedicated to many charitable causes. Born in Toronto to parents who immigrated from Italy, he is also devoted to his family. He was one of the original board members of Pier 21 in Halifax, and an Exhibition Hall in the Canadian Museum of Immigration there was named after him. Mr. Bratty has certainly fulfilled, and ever surpassed, his parents’ dreams for him. Congratulations to a fine businessman and corporate citizen who is an inspiration to us all! In Markham, a brand new exciting urban centre is coming to life. Downtown Markham is situated between highways 7 and 407 adjacent to Warden Avenue, and is home to retail stores, businesses, civic offices, cultural and entertainment venues, recreation facilities, residences and open spaces, all within walking distance of each other. The Remington Group is overseeing the development, construction and financing of this community, which was named “Best Places to Grow Community of the Year – High-Rise” at the recent Building and Industry Land Development Association (BILD)’s 32nd annual awards ceremony. This award honours the community development that best represents the goals of Ontario’s Places to Grow legislation, including Smart Growth through intensification. Among the criteria considered by the judges were environmental preservation, innovative site planning and architectural features, street lighting, recreational amenities, open spaces and landscaping. Downtown Markham certainly shines on all those counts. Downtown Markham is North America’s largest mixed-use urban development. Eventually, this community will house 10,000 residents and will provide employment for 16,000. This model urban centre is framed by the natural beauty of the Rouge River. Talk about a place where you can live, work and play! Rudy Bratty, Chairman and CEO of The Remington Group Inc., had been an enthusiastic proponent of Downtown Markham since the beginning. Congratulations to Mr. Bratty and The Remington Group for spearheading the metamorphosis of this incredible area! What a wonderful variety of condominium suites we have available to buyers today! Among the many choices are loft designs, which satisfy the lifestyle choice of purchasers who appreciate open concept at its finest. The terms “soft loft” and “hard loft” are used to distinguish between designs that include smooth finishes and those featuring concrete ceilings and/or floors, exposed bricks and plumbing. We are seeing fewer hard lofts nowadays, as so many existing buildings have already been transformed into condominiums. These homes in the sky are essentially wide open spaces with little built-in delineation of rooms. Owners have done some fabulous things to define certain areas by adding area rugs and furniture groupings that designate their use. The kitchen, living and dining areas may be completely open, and there may be a second level with a stairway to the loft. In these cases, the bedroom may overlook the main area – and with floor-to-ceiling windows, the effect on the walling is absolutely stunning. The point is, you have the choice to make these areas what you want. Maybe you’d like the office/den on the mezzanine level. Think of today’s two-storey lofts as a hybrid – like a townhome but on an upper floor as opposed to ground level. 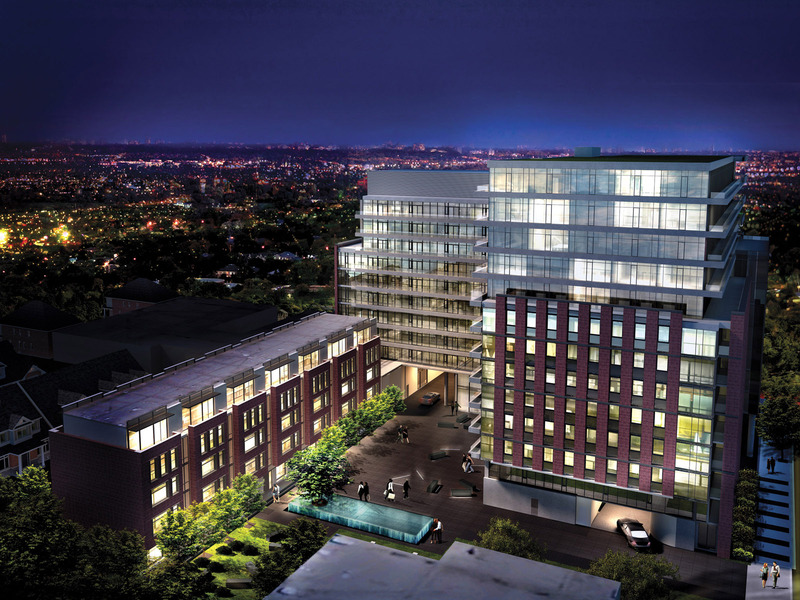 Two examples of condominiums that offer loft living are The Carlaw in Leslieville and 8 Gladstone on Queen Street West – both by Streetcar Developments. At The Carlaw, owners will enjoy striking 9-foot exposed concrete ceilings, engineered hardwood flooring, ultra-modern kitchens and bathrooms with stone countertops, and frosted glass sliding doors to the bedrooms. 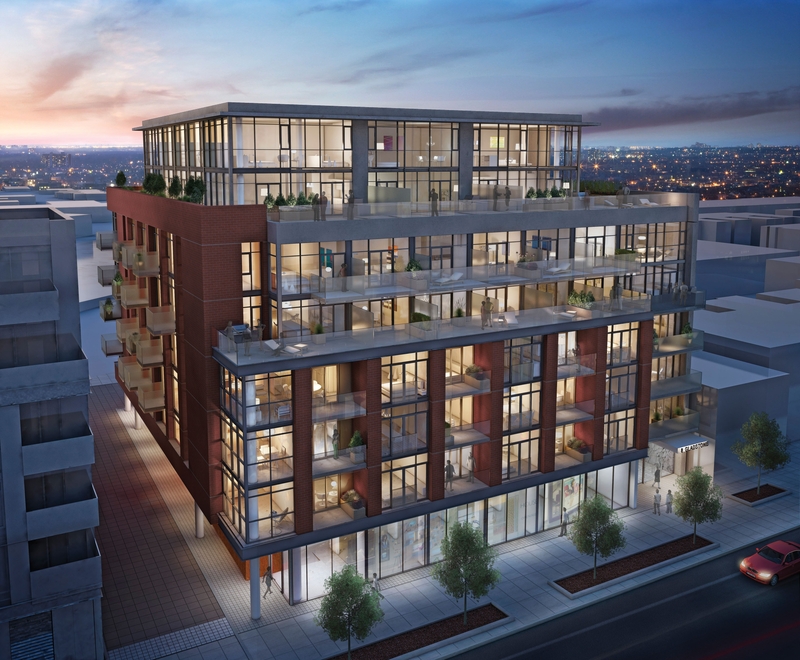 Some of the lofts at 8 Gladstone are two-storey penthouses with rooftop terraces and skylights. If you have lofty ideas about condominium living, consider buying a one- or two-storey loft design. You will have all the advantages of the amenities in the building, and you can choose what surroundings appeal to you most.